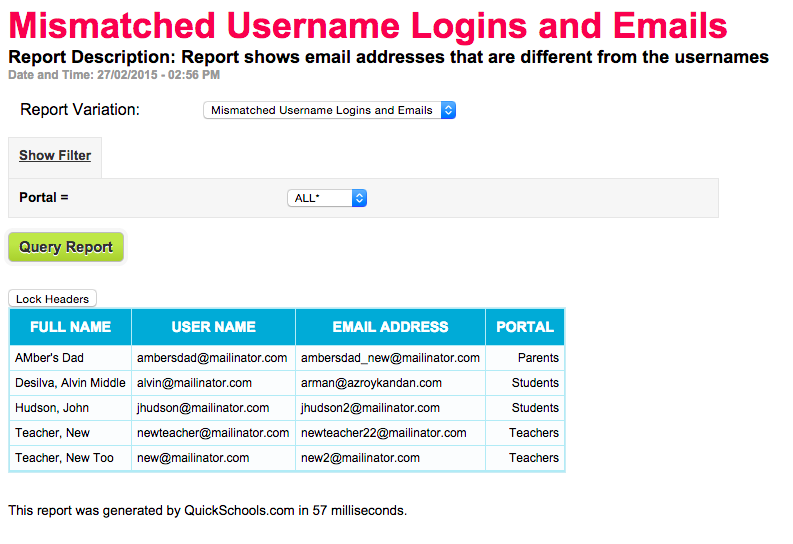 At times, you may want to check in on how people in your school are using their portals. To help with this, we’ve built a few Summary Reports on QuickSchools that you can take use to investigate. Here is a brief description of these reports, as well as how these reports may be useful to you. Usernames are managed by email address. When you invite a user to your account, it uses the email address to create a username. However, if you change the email address for a user, it does not automatically change the username. If you want to synchronize the username with the new email address, you have to re-invite the user to your account. The new invite will also issue a new password. To help identify users whose emails have changed, and are out-of-synch with the username, we’ve created this report called the “Mismatched Username Logins and Emails”. It simply lists out the current username and the current email address for users, if they are different. From here, you can use the appropriate portal management screens to re-send out invitations. This report lists out all users within your account. 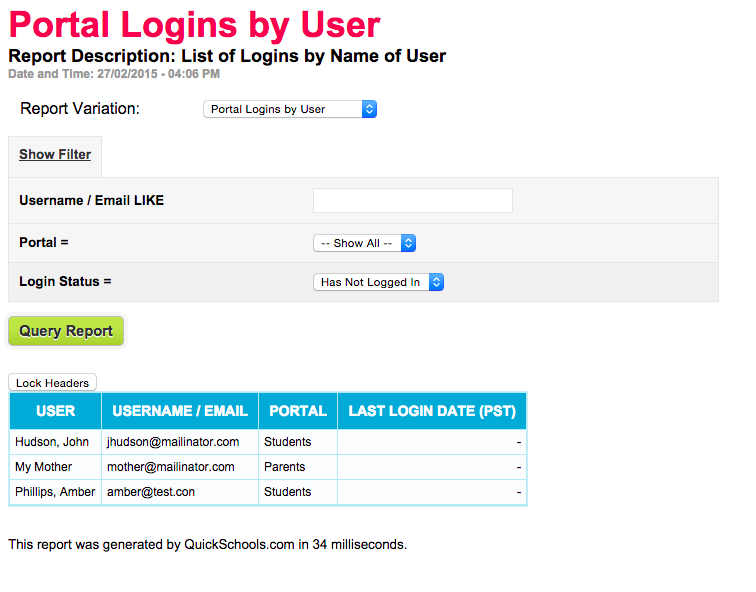 You can search by portal type (Teacher vs. Parent vs. Student), as well as whether the user has logged in before (i.e. Login Status). It also lists out the last time the user logged in, so you know if the user has been actively logging in. This report is very similar to the “Portal Logins / Username” report, except that is shows a history of when the user has logged in, along with their IP address. You can even filter by date range. This is useful for tracking activity for a particular user. This report can potentially get very large, depending on the number of users that you have. So for performance reasons, this report will only show data over the past 3 months. 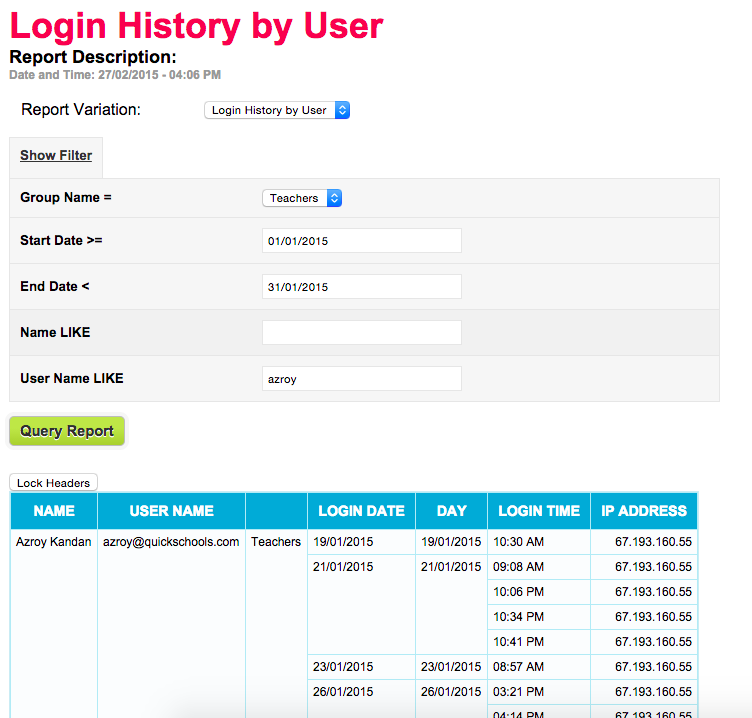 For login history going beyond that, please contact your QuickSchools support team. Hope that helps. Do let us know what you think about these.